On to France…..The French use the term soucil de hanneton to for this style of fringe, which translates as the eyebrow of the cockchafer, or May beetle. In the fourth edition of the Dictionnaire de L'Académie française (1762) one of the definitions of soucis d’hanneton is, “Les Frangers appellent Soucis d'hanneton, Des franges qui portent de petites houppes.” This translates roughly as, “The fringes known as Soucis d’hanneton are small tassels.” Houppes can be tassels, or tufts or puffs take your pick. Regardless of the nomenclature, by 1762 the phrase was used for a specific type of trim. (Please note the shift in French usage from 1762’s “soucis d” to the 20th century’s “soucil de,” is not a typographical error.) The European May Beetle is not the American May Beetle; they are two distinct families. The European was invasive and very common in the spring, thus a visually well known insect. So what does one look like…. Looking beyond the bug, which has a certain charm, imagine the two antennae, which are the large orange fan-like projections as a silk strands joined together with a knot in the middle—fly fringe or soucil de hanneton. I really like idiomatic descriptions and this is a great one—beetlebrow for silk trim. 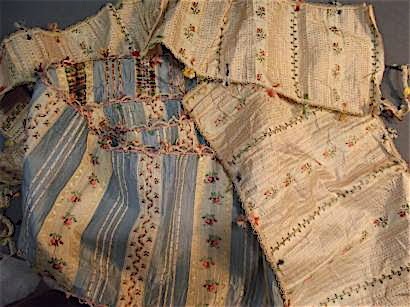 Pieces from 18th century dresses, the white pieces have sourcil de hannneton applied discriminately to the edges. The French still use this term to describe this trim, but English speakers do not. Whether or not we retain foreign words or phrases seems to have no logic. The May Beetle was as well known in the UK as in France, so why not keep the name? It may be that the finished product resembled the hand tied flies used in fishing as much as they did to a beetle’s brow to the British. Certainly to an American who had no experience with the European beetle there would have been no connection to tie the image and a word together—a fly would do as well, or even better than a beetle to describe the fringe. 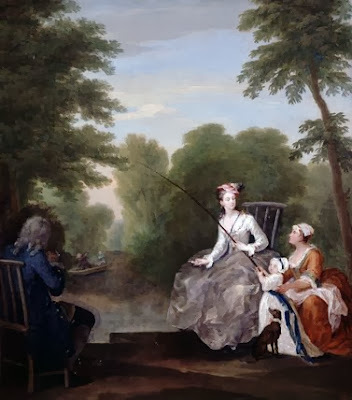 Unfortunately this is all conjecture, at the moment there seems to be no direct connections between the use of the term fly-fringe and the 18th century. 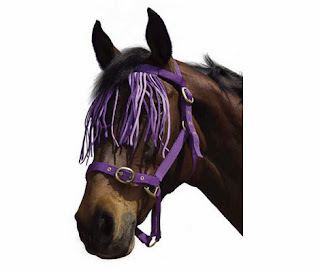 Compounding this is that the term fly-fringe most directly relates to the fringed band or crocheted bonnet that horses wear to keep flies away from their faces and is known as fly fringe. Take your pick horses or fishing, both were pursuits open to women in the 18th century and may have ultimately provided the term fly-fringe. Certainly by the beginning of the last century the notion that the trim resembled flies was solid enough that it required no further definition when used in The Ladies Realm article. That being said the 18th century term most resembling the technique is soucil de hanneton, but I don’t see that one overtaking fly fringe in the near future. Jeffrey Hopper is an author and editor who blogs about men's wear and related topics for SilkDamask. You may reach him at this site.